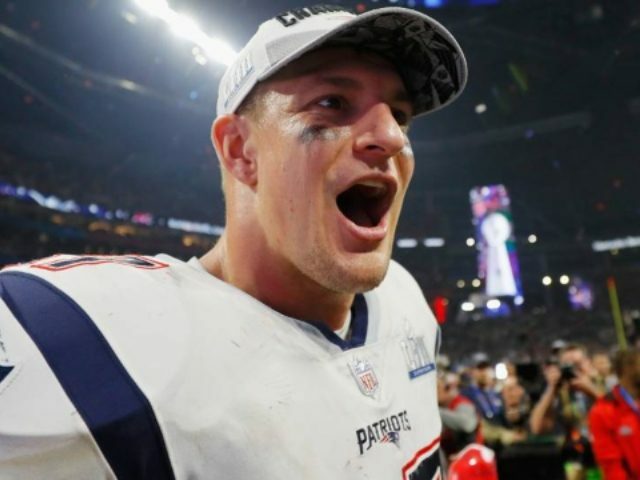 Patriots tight end Rob Gronkowski is well-known for his ability to track a football in flight, and raise his hands to catch it. That is, unless he’s partying on top of a bus during a victory parade. In that case, not so much. Gronk and friends were having themselves quite a time on top of their bus as it traveled through Boston. Along the way, a bunch of Pats fans who are a lot less accurate than Tom Brady began throwing footballs at the bus. The results were not good for Gronkowski’s face. A football to the face is no way to reward a returning champion. Then again, given the strong evidence of inebriation a top the party bus, there’s a good chance Gronk won’t remember any of this.